A glittering assembly of the brightest and best of UK plc gathered at Claridge's last night to toast the winners of the Britain's Most Admired Companies Awards, 2013. The awards, presented in association with BSI and now in their 23rd year, are unique in that the results are arrived at via a rigorous and independent process of peer review. You cannot enter, you cannot lobby, there is no panel of judges and no horsetrading to decide the winners. 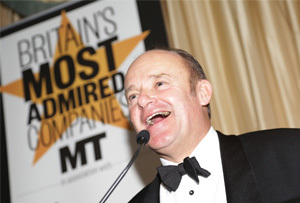 The ceremony itself was co-hosted by editor Matthew Gwyther and MT’s founder Lord Heseltine, and the top gong – Britain’s Most Admired Company 2013 – went once again to premium booze supremo Diageo, past winner in 2008 and 2012. And just to prove that we don’t make this stuff up, here’s a short video of Matthew Gwyther and deputy ed Andrew Saunders talking through the award highlights at Claridge's, only minutes before the curtain rose. With three wins under its belt, emerging-markets expert Diageo is now second only to the once-mighty Tesco in the annals of BMAC history. Tesco won no fewer than six times in the noughties, although today’s gloomy Q3 results suggest that it may be a while before beleaguered boss Phil Clarke adds a seventh to that tally. Collecting the award, Diageo’s ex-CEO, veteran deal-maker Paul Walsh, who stepped down in the summer, said: ‘One thing I have learned is that awards like this matter.’ His successor, Ivan Menezes, has big boots to fill – will we see him on the podium next year? In second place came housebuilding phenomenon Berkeley Group, whose MD, Rob Perrins, accepted the coveted Most Admired pewter star. Other top 10 winners included John Lewis Partnership in fourth, Hull-based speciality chemicals star Croda International in fifth, and soaraway budget airline easyJet in ninth place. Guest speaker, MT Diarist and City grandee Sir Howard Davies, welcomed the spirit of optimism and renewed confidence in the room. But he also reminded all present of the need to invest to achieve real growth and secure the future with the rallying cry ‘Go on. Take a punt!’ A sentiment no doubt echoed by high-octane bookmaker Paddy Power, which came eighth overall. For the full rundown of Britain’s Most Admired Companies 2013, click here.